Content marketing involves a complex process of strategizing to achieve goals, producing content, distributing it, and analyzing the results. In a market flooded with information, integrating content with a variety of distribution options, and catering to a risk-averse buyer means this four-step process is challenging, even for the pros. Enter the content marketing platform. 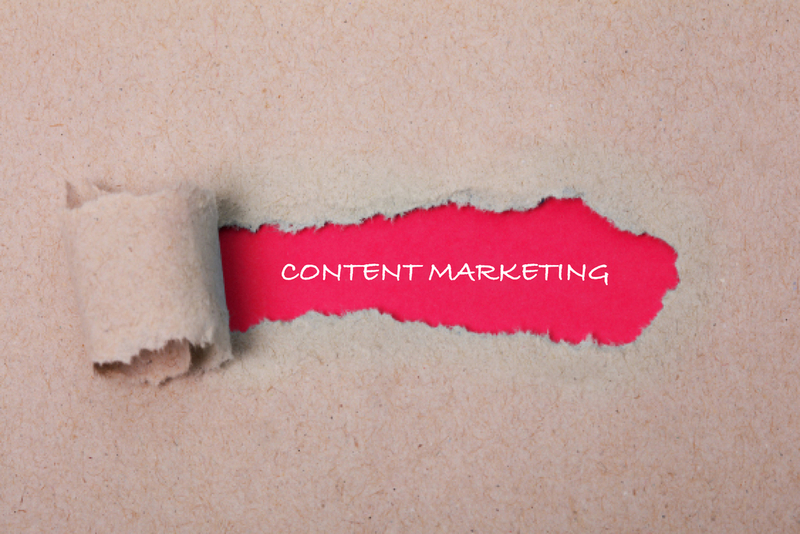 With a 124% higher response-to-win rate and 44% higher conversion rates for content marketing software users, it’s clear that a connective-tissue solution aiding all stages of content marketing is necessary in an increasingly complex content marketing landscape. 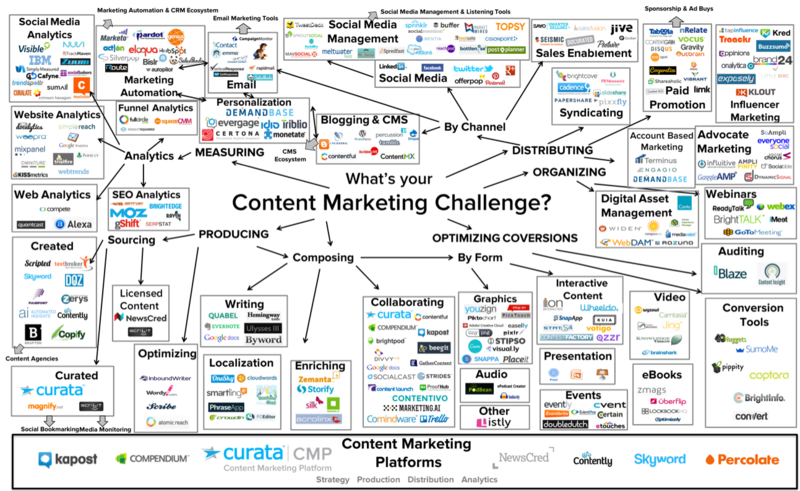 However, there are over 100 vendors selling content marketing software. Plus, hundreds of dedicated solutions for email, marketing automation, content management, digital asset management, and social media management. This means the process of finding a solution to simplifying your content marketing strategy can be just as convoluted as executing it. 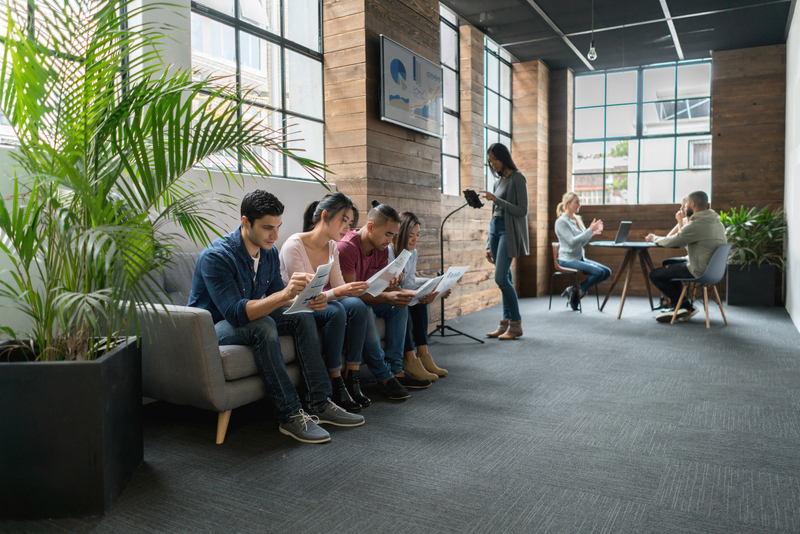 This article covers everything you need to know—including the right questions to ask—to pick the best content marketing platform (CMP) for your organization. First some background. The shift from outbound to inbound marketing started over a decade ago. As digital grew, the need developed for sales force automation software (SFA), followed by a need for marketing automation software (MAS). SFA and MAS centralized sales and demand generation in one place. In conjunction with the emergence of sales and marketing operations teams, SFA and MAS increased the visibility and accountability of marketing leads and activities. However, even with the introduction of SFA and MAS, there was still a missing level of support necessary to the sales and marketing process. Content fuels and supports marketing automation. It’s needed for everything from website content (which marketing automation tracks), to email campaigns, to pay-per-click landing page offers. Without content, many of marketing automation’s key components are irrelevant. Drip campaigns don’t work if there is no content to drip to leads. Lead scoring stops without content for a lead to browse. 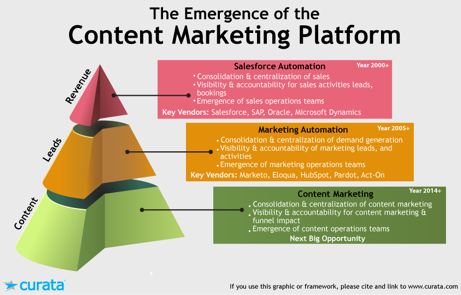 A Content Marketing Platform is a software solution that enables marketers to drive awareness, leads, and revenue from content. It makes it much easier and more efficient to supply content downstream to generate and nurture the leads that are converted to opportunities and then revenue by sales. It enables a data-driven, scalable, and multi-channel approach across four process areas: strategy, production, distribution analytics. Marketing Automation Platform (MAP): MAPs allows for automated, repetitive marketing actions such as emails, social media posts, and other website actions. MAPs are lead and demand generation focused. While MAPs are integral to the success of content marketing, they aren’t content focused. Examples of MAPs include: Marketo, Pardot, and Eloqua. Content Management System (CMS): CMSs allow you to build websites and blogs without coding. CMPs and CMSs work together but have different functions. CMPs are designed to orchestrate the development, delivery, and analysis of content to CMSs, as well as many other types of digital media entities. Examples of CMSs include WordPress and Drupal. Project Management Software: Project Management Software allows project planning, scheduling, resource allocation, collaboration and communication between project stakeholders. Examples include Trello, Asana, and Basecamp. While these are useful, CMPs allow you to track productivity as well as align content and campaigns with business objectives, and approach creation strategically around marketing goals and past analytics. Many content marketers today find it difficult to precisely track how their content is performing throughout the entire sales cycle. In fact, only 30% of leading marketers feel they are effective at measuring content marketing’s impact on the bottom of the funnel, and only 8% of marketers consider themselves “very successful” or “extremely successful” at tracking content marketing ROI. 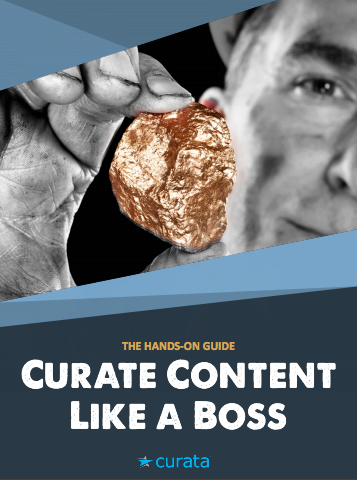 It’s also common for content marketers to store their content supply chain in disparate systems and spreadsheets. A content marketing platform centralizes access to your content, and provides clear analytics to inform your content creation in the future. Have a unified, consolidated view of your entire content supply chain from ideation to production to promotion. Have top-down visibility on how your content is impacting lead and revenue generation, and marketing and sales pipeline. A CMP gives content marketing managers a data-driven and scalable way of managing the content supply chain and understanding its contribution to business growth. You can organize content by stage in creation, funnel stage, content type etc. 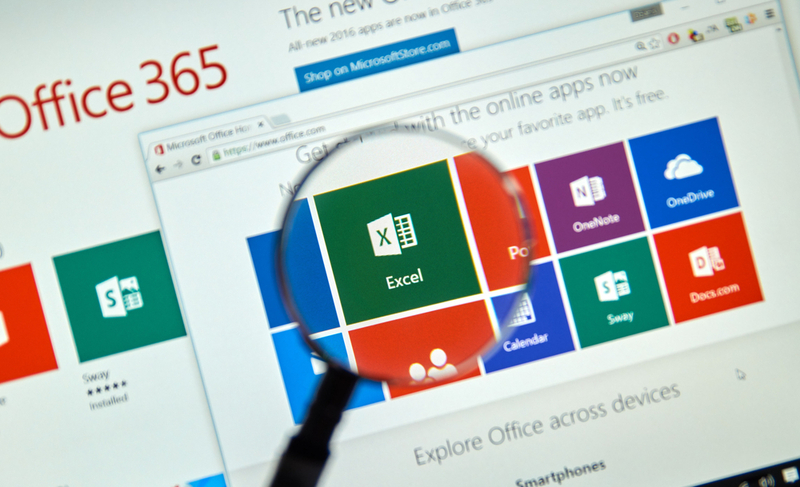 Excel spreadsheet: This option is cheaper but highly inefficient for metrics and tracking. Tracking manually is time consuming and leaves a lot of room for error. Other software combo: If you already have related software it might save time on implementation. However, integrations don’t always work. If you have determined that your organization needs a content marketing platform, it’s time to assess your wants and needs. The software research and vetting process will be much smoother if you start your search with a good idea of what you can afford, the current gaps in your team’s workflow, and the capabilities most important to your team’s success. CMPs can range in price from $8000 to over $100,000 a year. If you’re a small business owner or don’t produce much content, a content marketing platform costing $60,000 a year is unlikely to be great value. It should be obvious that your software and the content you’re creating are generating value, not reducing it. Change management is an under-addressed topic when it comes to implementing new marketing software. Switching marketing software can take hours of time per person and temporarily cut into your team’s productivity. How a software company helps you implement their product is often indicative of the sort of relationship you’ll have with them throughout the software’s life cycle, so keep this in mind as well. A good content marketing platform should help throughout all stages of the content marketing process. This means there should be some level of support from strategy through to analytics. Different platforms cater to different needs in different stages of the process however. Do a gap analysis of your content marketing process and use that to point to related questions. 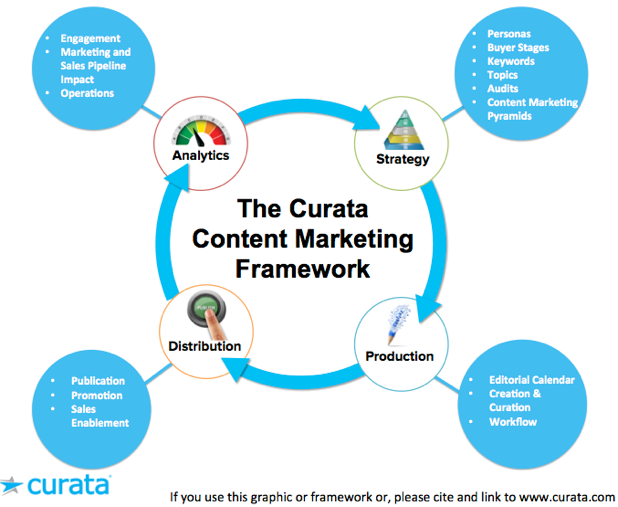 Here’s how Curata breaks down the parts of the content marketing process, and some areas to examine when determining if there’s holes in a strategy. Editorial Calendar: Not all editorial calendars are created equal. Be sure to understand how you want to sort, organize, tag, export and distribute through your editorial calendar. Content Auditing: Some CMPs have the capability to look at gaps in your content and content strategy. Eliminating the need to execute a manual gap analysis can be a huge time and cost saver. Internal Communication: This feature enables communication and collaboration on content across teams. Distribution: Distribution features vary across CMPs. Some CMPs allow you to distribute to social, your blog, website, email, native ads, paid ads and more, while others are limited. Integrations: Does it play nicely with platforms such as WordPress or Marketo? These vary widely for each CMP. Leads Generated by Content Tracking: This is a pretty standard feature when it comes to content marketing platforms. Tracking leads generated by your content is integral to the success and development of most marketing strategies. Revenue Generated by Content Tracking: Some CMPs offer analytics that track your content directly to revenue. If you want to prove the ROI your content team is generating, this is a feature to prioritize. 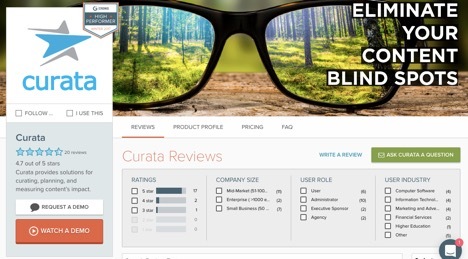 Connect to Content Creators: This feature allows you to shop and hire reputable content creators directly from your CMP. 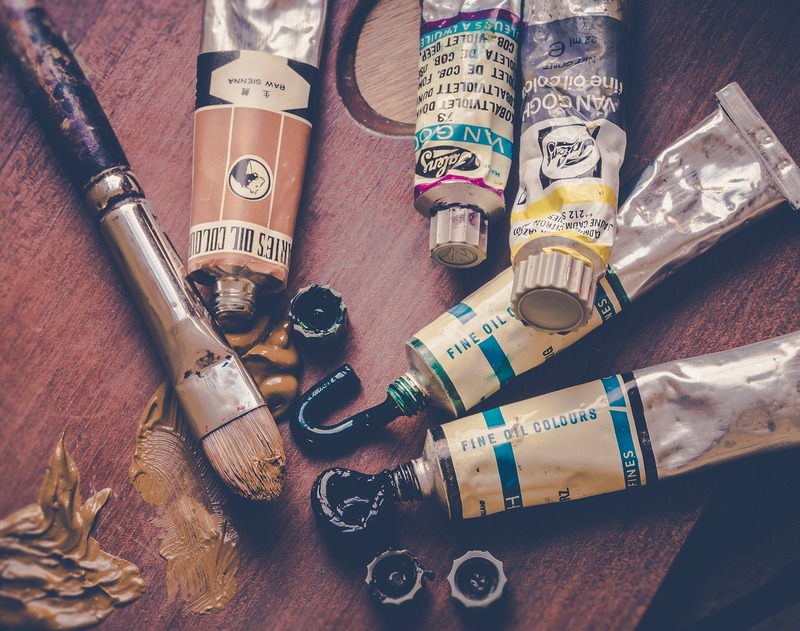 Asset Library Management: CMP houses content assets for you in one place. 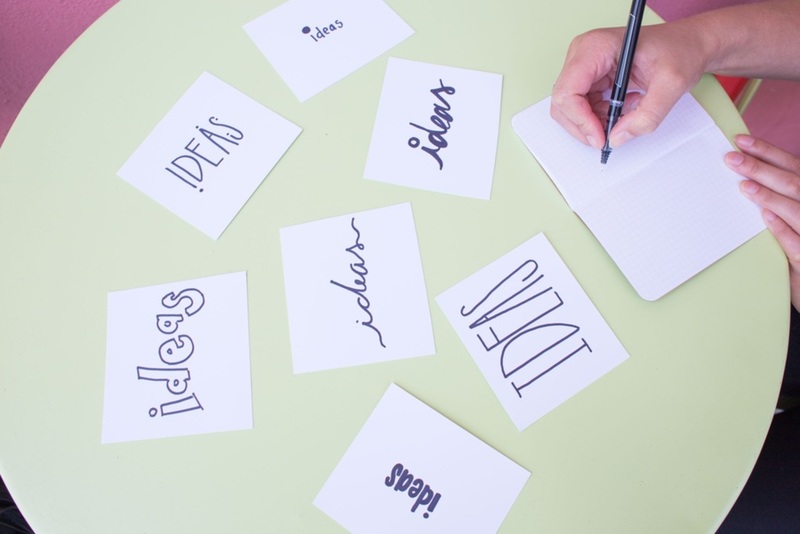 Ideation: Dedicated module for brainstorming and sharing ideas. Post-Download Engagement: This feature allows you to track your prospects’ interaction with your content after it’s downloaded. Real Time Analytics: Results and insights from your campaigns instantaneously. Account Based Marketing: Drill down into prospect interaction on your website by company. Sales Enablement: Sales enablement features manifest in different ways. This can mean anything from a simple library housing all sales-enablement content, to a feature that, when content is uploaded into your library, pushes custom, automatic notifications to your sales team and allows them to directly attach it to email. Custom Reporting: How many ways can the software run reports? Are you interested in dividing the data in more than one way by buyer persona, stage, author, etc. After determining your priorities for your content marketing platform, it’s time to start researching CMP options. Consider the following. Will my team actually use this? Is this useful for other departments? Is this vendor flexible in price, implementation, etc.? Is the software flexible? Are there varied use cases? Will this software scale with my company? Can it generate custom reports? Does it allow for easy external/internal communication? The vendor’s website and content are a good indicator of how you could use the software and the type of content you can create with it. Most software companies include testimonial and case studies on their website. If you’re looking for something specific, reach out to sales. You can do this before or after your demo call. 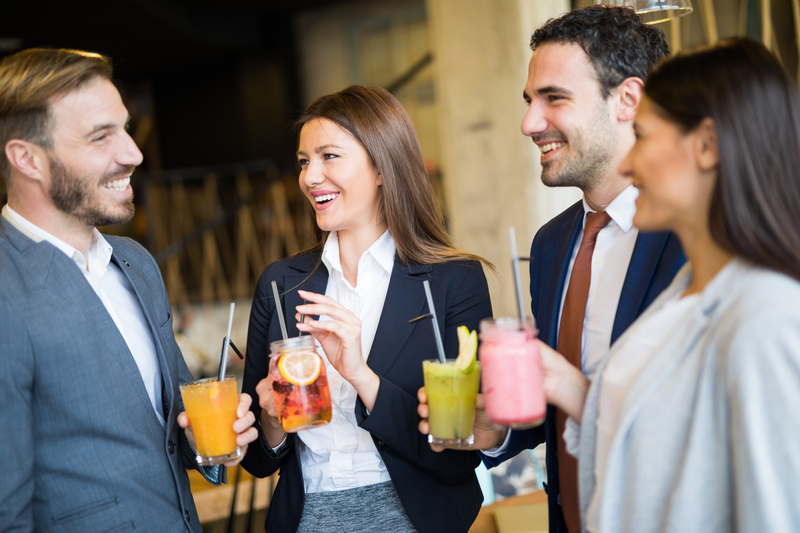 Speaking to an existing customer can give you a more thorough idea of how the software has performed for other organizations beyond the information shared on the vendor’s website. After researching vendor options, pick your top two or three CMP choices and schedule a demo. This will give you a better idea of what the interface looks like and how your team could benefit from the software. Does your platform integrate with XYZ software? 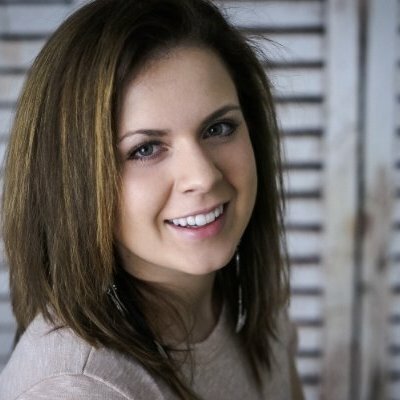 What kind of support will I get after onboarding? Is there a limit on the amount of content/leads collected/customers/ etc. before having to pay more? 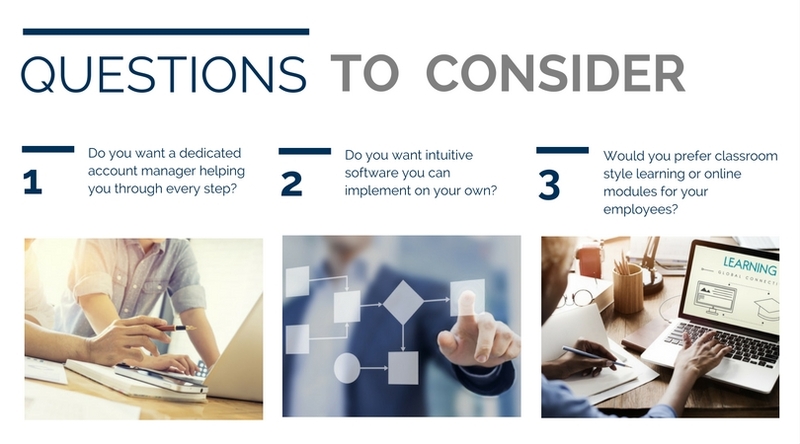 Are you able to customize your software to my specifications (if there’s an added feature or change that would make the platform more attractive to your organization)? How often do you update this platform? What updates are in the pipeline? It’s also beneficial to make a list of key features/processes you want the vendor to cover in the presentation and create score cards based on the priorities you outlined above. 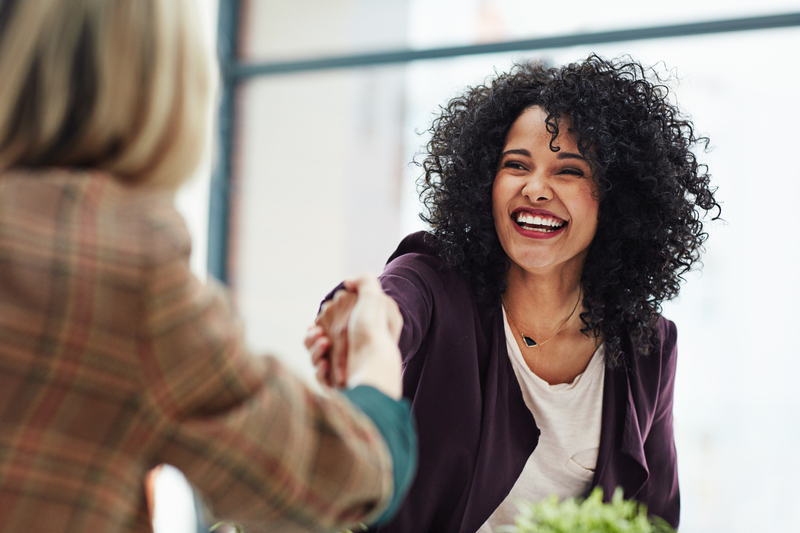 Once you’ve asked questions, gone over score cards from potential vendors, and reviewed the product demonstrations with your key stakeholders, it’s time to make a selection. At this point, it’s a good idea to develop goals and key performance indicators for the software. This will help you measure the software’s effectiveness and aid your decision-making process when it’s time to renew. As you can see, choosing a content marketing platform that does what you need requires significant due diligence. You need a clear understanding of what a CMP is, how it can add to your organization’s bottom line, understand exactly what goals/processes you need it for, consider the implementation process, and figure out the key features you need. 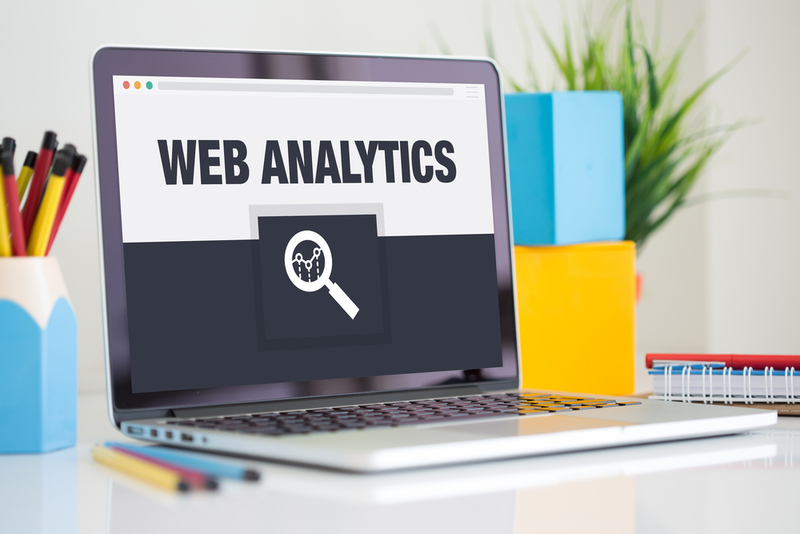 One of the most important things a good content marketing platform will offer is granular analytics capabilities that allow you to measure exactly how your content is performing. Learn how to use data and technology to optimize your content marketing ROI with The Comprehensive Guide to Content Analytics and Metrics eBook below. Wow. That’s quite complicated. We’ve recently decided to start using marketing automation with GetResponse and now I find out there are content marketing platforms. It’s a tough world to navigate! wonderful article, but sometime content marketing I personally found it bit difficult to maintain. Kindly let me know if you have any article where I can learn about how to manage all these activities. Or any tools available.